Microsoft on Tuesday provided details for how those not currently running Windows 8 can purchase the forthcoming Windows 8.1 operating system update. 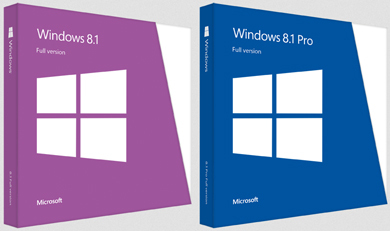 On Oct. 18, Windows 8.1 is scheduled to become available as a free download for current Windows 8 users. PC manufacturers are also expected to launch new systems that day running the updated OS. For non-Windows 8 users, however, the update will be available as a for-pay download from Windows.com and as a boxed DVD from retailers. Windows 8.1 will retail for $119.99, and Windows 8.1 Pro for $199.99, according to a blog post by Brandon LeBlanc, senior marketing communications manager at Microsoft. These are identical to the retail prices of the Windows 8 and Windows 8 Pro upgrades, he added. LeBlanc gave some notes for what upgraders can expect when they install Windows 8.1 on their older Windows machines. For Windows 7 users, installing Windows 8.1 will transfer all of their files, but desktop applications -- including Microsoft Office -- will need to be reinstalled. Microsoft does not recommend upgrading from Windows XP or Windows Vista to Windows 8.1, though it is possible. "Windows 8.1 is not designed for installation on devices running Windows XP or Windows Vista," according to LeBlanc. However, "consumers still wanting to upgrade from Windows XP or Windows Vista should buy the retail DVD instead of using the download and boot from the DVD to do a clean install of Windows 8.1." Microsoft also recommends that Windows XP and Windows Vista users back up their files and settings and then reinstall them after performing a clean OS install.